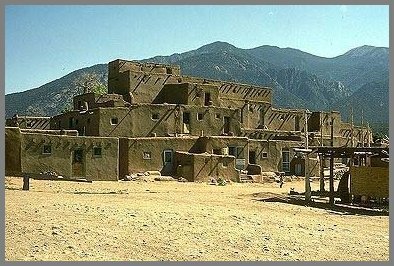 As Reese notes, Lost Mesa is obviously based on the real Taos Pueblo (below). 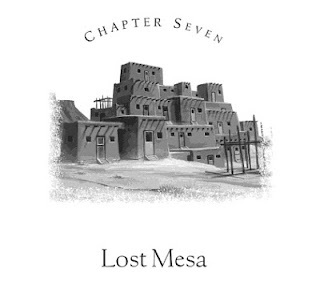 According to the book, the Navajo reservation was supposedly created to hide Lost Mesa. Even worse, "Persian magi actually established the preserve" before the Europeans arrived. The "Anasazi" and later the Pueblo and Navajo people only "managed" the "preserve" for its magical inhabitants. There's more, but this is enough of an insult. It reinforces the typical Eurocentric belief that Indians didn't accomplish anything themselves. Native civilizations must've been built by lost races of white men or space aliens. Indians were only "savages" who couldn't do much more than grunt and kill people. Actually, the Pueblos and their ancestors must've built hundreds of Pueblo-style structures throughout the Southwest over the last millennium. That demonstrates how unmagical and unremarkable the architectural skill was. It's ridiculous to turn an ordinary but "exotic" culture into a fairy-tale place inhabited by wizards or whatever. For more on lost civilizations, see Indiana Jones's Criminally Bad Archaeology and "Light Beam" from Maya Pyramid.